"This is a fabulous appetizer; it does take a little time to prepare, but the taste is well worth it. If you want to freeze them for later use, they turn out just as good; just pop them in the freezer after filling the cups and then bake a bit longer then in the original recipe." Line each cup a mini-muffin pan with a wonton wrapper, carefully pressing each into the shape of a cup. Take care to not tear the wrapper as they will tear easily. Bake in preheated oven until golden brown, 8 to 10 minutes. Transfer 'cups' to a baking sheet; repeat until remaining wontons are all baked. Heat a large skillet over medium-high heat. Cook and stir sausage in the hot skillet until browned completely, 5 to 7 minutes; drain and discard grease. Set sausage aside to cool. 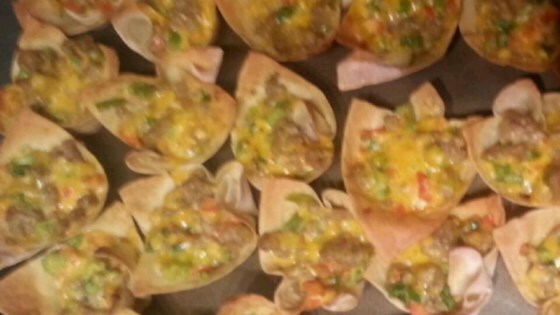 Stir cooled sausage, Colby cheese, green onions, red bell pepper, green bell pepper, and ranch salad dressing together in a bowl; spoon into the wonton cups. Bake in oven until cheese has melted and is beginning to bubble, 15 to 20 minutes. These are delicious and addicting!! We made this for the wife’s wine party. Exactly as shown. It was a big hit all the women loved them. Simple and tasty appetizers are hard to find. This one is very good.